Leviton 5-Wire 4-Pole 3-Phase watertight industrial grade North American pin and sleeve inlet in blue color, has Valox 357 construction for added durability. 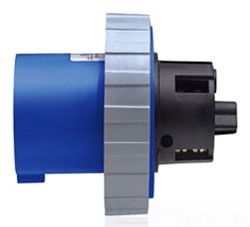 The pin and sleeve inlet with reinforced nylon contact, has a dielectric strength of 2000-Volts. It has a current rating of 100-Amps and voltage rating of 120/208Y-Volts AC. It has a length of 5.71-inches. The pin and sleeve inlet offers IP67/IP69K degree of protection. The pin and sleeve inlet meets North American IEC 60309-1, 60309-2, 73/23/EEC, 93/68/EEC CE marking, CSA C22.2 No 182.1, IEC 60309-1, 60309-2, UL 1682 and 1686 standards.